The increase in sales of previously owned homes and new single-family residences in April illustrates growing demand for owner-occupied housing and the improving ability of prospective homebuyers to save for downpayments and handle monthly mortgage obligations. Interest rates on residential mortgages remain near historic lows, maintaining housing affordability and stimulating a higher volume of single-family home purchases even as prices continue to rise and for-sale inventory remains limited. Low interest rates and a slight moderation in mortgage lending criteria will continue to propel the single-family home market in the near term, and builders could be encouraged to introduce more starter homes to the construction cycle to capture rising demand. The stability of the labor market and modest income growth continue to enable a transition into owner-occupied housing, suppor ting an increase in purchases. Sales of existing single-family residences excluding condominiums rose 6.2 percent over the past year to push up the median price to $235,400, a new high in the post-recession period. Inventory remains tight, however, signaling that some demand may remain unfulfilled and that prospective buyers will continue to confront rising prices and keen competition. The supply of single-family homes for sale compressed to 4.5 months in April. A six-month level of supply is regarded as equilibrium, and the market has been below that mark since June 2012. Despite rising demand for single-family homes, developers continue to encounter obstacles to accelerating production. Annualized, construction started on 778,000 single-family residences last month, significantly less than the long-term average. 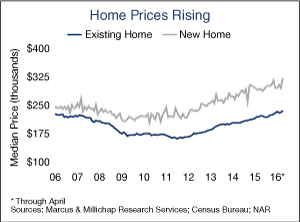 Homebuilders are focusing heavily on trade-up homes at the exclusion of so-called starter homes, as evidenced by a rise in the median price to nearly $322,000 in April. Builder confidence remains high, however, and contractors could broaden the mix of offerings to include models with entry-level prices in the coming months to attract a larger share of homebuyers. The homeownership rate has sunk from a high of 69.2 percent prior to the recession to 63.5 percent in the first quarter, the lowest point in over 20 years. Apartments have captured a considerable share of housing demand, and U.S. apartment vacancy nominally rose in the first quarter to 4.2 percent, or roughly 100 basis points below the long-term average. Approximately 285,000 units are on track for completion this year, the high point during the current cycle, and while pockets of overdevelopment will likely emerge in select submarkets of major metros, demand remains strong and the absorption of nearly 258,000 units will keep vacancy near historical lows. The healthcare industry is evolving and medical providers are taking a more patient-centered approach, encouraging new development to follow rooftops. Ambulatory care centers, urgent care offices, outpatient services and physicians are locating near residential subdivisions to better serve the community. This year, an estimated 12.2 million square feet of medical office space will come online, and a large share is away from hospital campuses. This entry was written by marcusmillichap, posted on June 14, 2016 at 9:10 pm, filed under Commercial Real Estate, Housing, Research, Uncategorized. Bookmark the permalink. Follow any comments here with the RSS feed for this post. Post a comment or leave a trackback: Trackback URL.